I have hunted 106 Products since I started with steemhunt, I was out for about 4 months on any graphene platforms due to some family issues. I am no where near @teamhumble‘s numbers though!! hitting 800 Hunts damn man. I want to showcase some of my most favorite hunts, because I hunted them first. Coming from the steem blockchain and some of the many tools the great community has created. Please see below. ChronoCrypto here with another epic hunt and this one is a must. 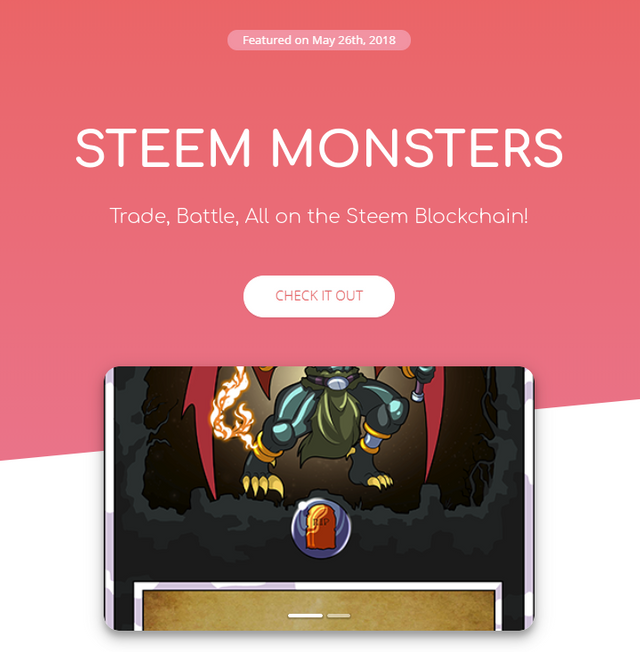 The Steem Monsters Pre-Sale is Starting! PURCHASE YOUR CARD PACKS NOW AND BE READY ONCE THE TOURNAMENTS BEGIN! This is awesome I have been waiting for these since their first announcement. Just like pokemon but on the blockchain. Chronocrypto here with a steem tool platform, It is a beautifully made one I can assure you it is extremely pleasant to the eyes. It shows you all upvote and downvote related transactions as well as the vote value and self-votes etc all done on the blockchain. You might want to have a looky look. 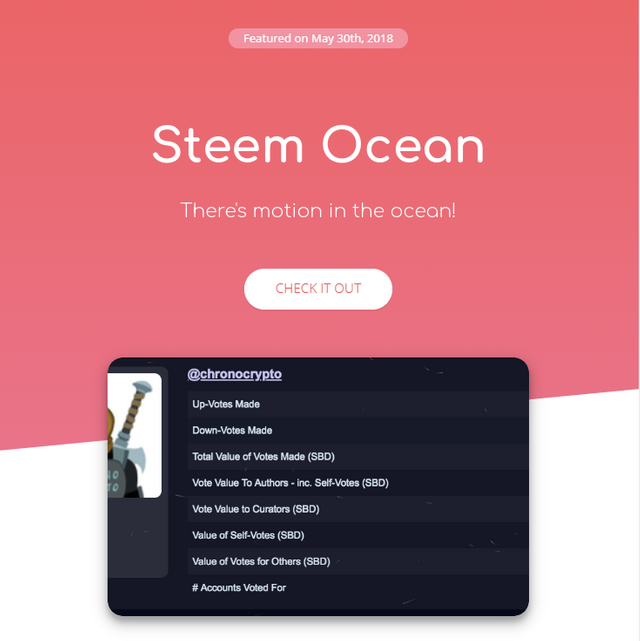 Steam Ocean provides insights and services that help users of the Steem blockchain safely navigate the high seas of Steem! 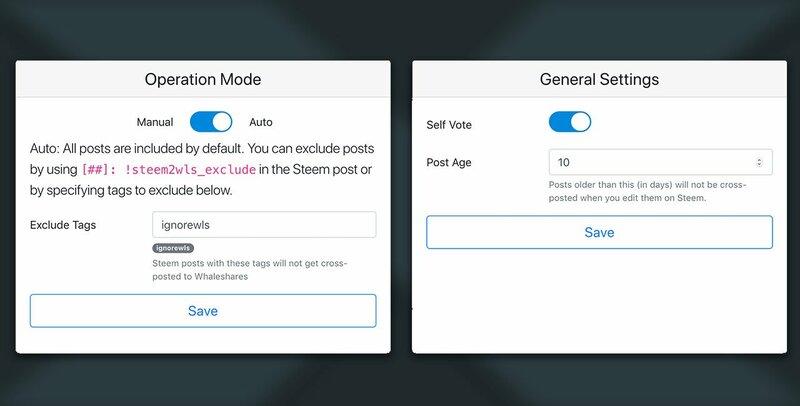 Steem is both a public blockchain technology, a cryptocurrency (like Bitcoin) and the foundation for many social/community websites which reward their users with payment in exchange for their posts. The original site for Steem users is Steemit.com, but others exist too with various styles and missions. Created by @ura-soul – He is a witness for Steem. Have you bought some @steemmonsters cards yet? 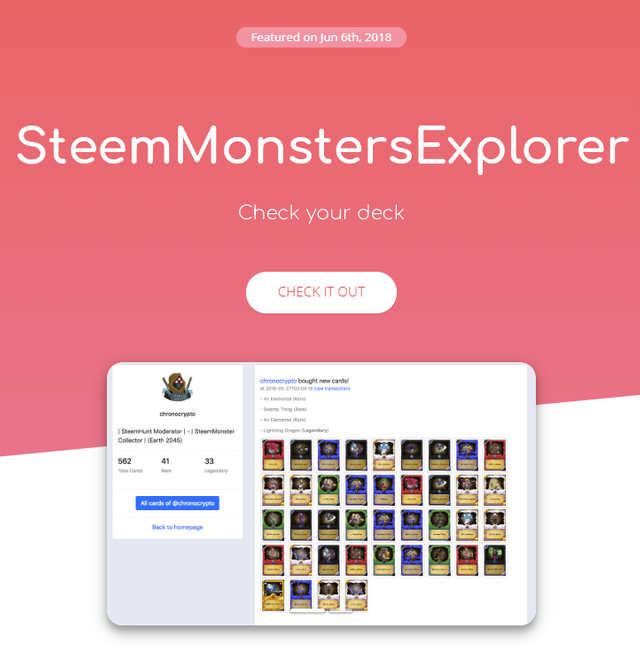 Well if you have you can check them out now on the steemmonsters explorer nice little design. With this explorer, you can check your transactional cards, bought trades etc. Being part of steem’s blockchain means you can also spy on others cards. Buy, trade cards you want you can even send offers to them if you like the level of the cards. I am always on the hunt for the latest open source products and Steem products. I have used them once before and now the just launched their site. 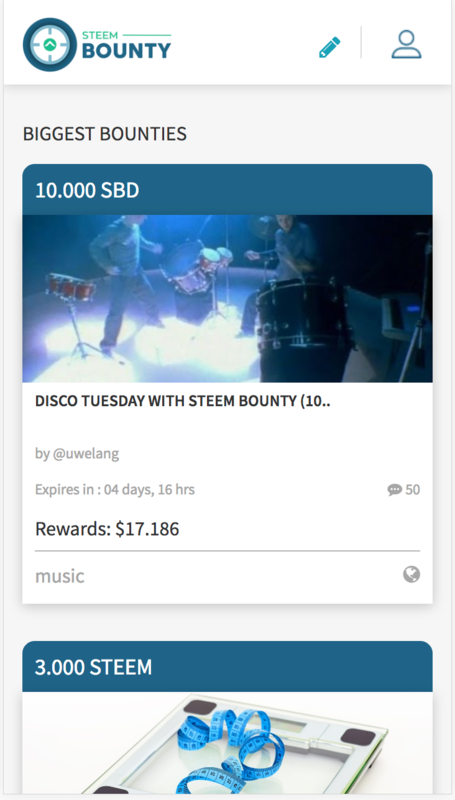 There is only one thing that Steem Bounty, can do which is to allow bounty hunters to quickly find posts with bounties and for bounty creators to get exposure. But it does it so well and the interface/ platform is just so beautiful I can tell you from my vast steem hunts every platform created on the steem blockchain is just eye-catching, Steem Bounty is no exception. Creating a bounty post on your phone is also very simple and it works out great. The owner of the bounty creates a post, of what he wants to be made and or done and pays out a bounty. Now the bounty hunter which would be you since you are already a Steemhunter, checks out the site and looks around to see what he can complete to obtain that said bounty. Want to learn more go Read their platform launch post. I am always on the hunt for the latest open source products and Steem products. Elegance is a platform where artists of all kinds – painters, designers, print-makers etc can express their imaginative or technical skills and get rewarded in return. You can for sure post your own creation, I can also see this bad boy getting some love from @misterdelegation. Do you love to draw, paint, create renders etc? Well, then this place is calling your name. This platform can become alternate to sites like DeviantArt, CGSociety, and Pixiv operating on Blockchain, Which is 1000x Better. Side note: The steem blockchain is getting all the best platforms around the world and running them so users can finally earn something for all their creativity. 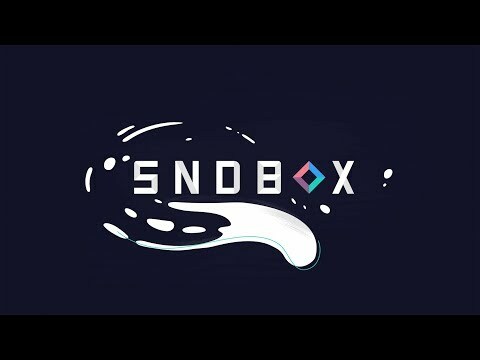 @sndbox is a Steem “blockchain powered incubator. Thier community is a global and diverse network of artists, writers, designers, musicians and non-profit institutions.” Which you have probably seen them doing many contests on logos for their own design, other companies and contest for varies creative aspects of the blockchain tech. 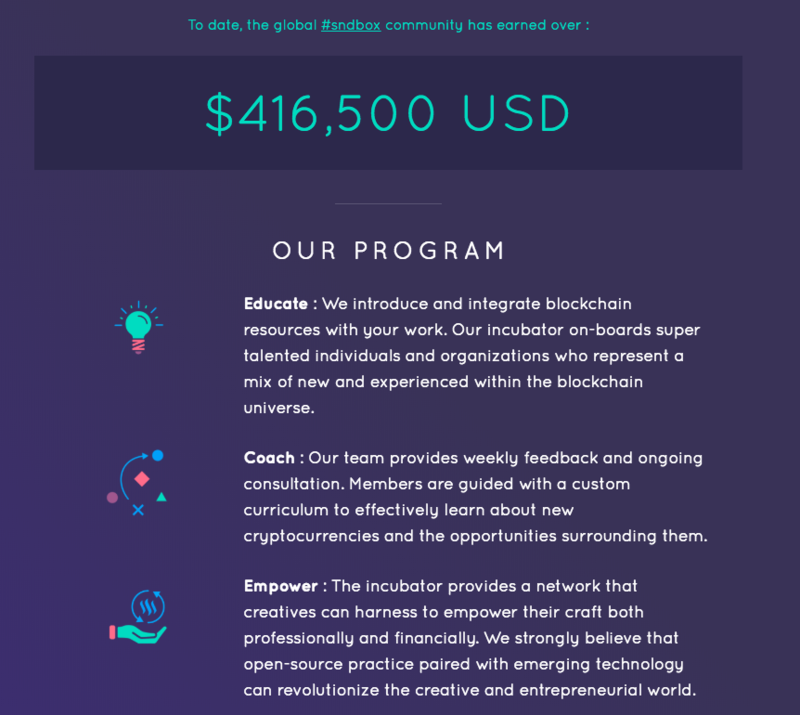 Sndbox helps members learn about and earn cryptocurrency to empower innovative projects and creative ideas. Your ideas get handsome votes, keep in mind though you must be a member, and applying and getting accepted means you need to put 100% into your work. They use the Steem foundation as an avenue for fundraising and as a forum to share research across the whole of the blockchain ecosystem, which means again you get rewarded for content that is not only impressive but worthy of a placement on the steem blockchain. It uses main STEEM posts as questions (polls), replies of the STEEM posts as votes. See an example poll and it’s corresponding visualization on steemit. 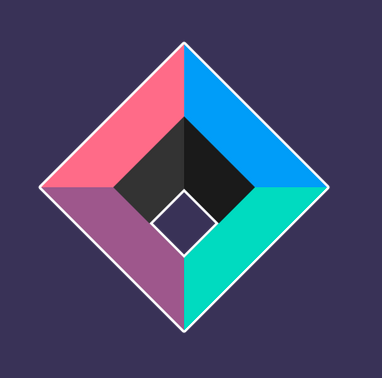 A cool tool to post polls and get results from steemains. Built on top of the steem blockchain. Been a long time but I am back and with a nice little tool!! Cross post your work from steemit to Whaleshares. steem2wls rocks! Why? Because it has never been so easy to cross-post from Steem to Whaleshares! The setup is super easy to do! What are some of your best hunts that you enjoyed hunting! Post below.